Love God and love your neighbor. It sounds easy, doesn’t it, but we all know it’s not. 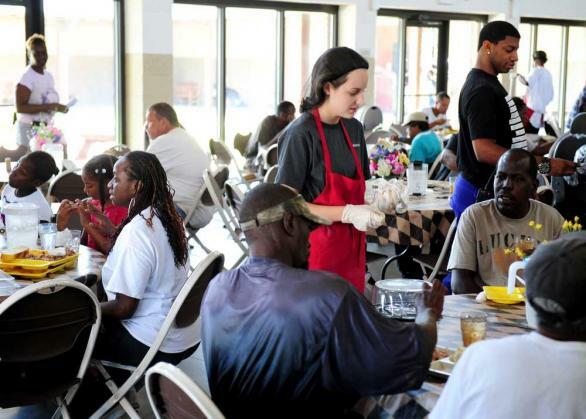 Nora Gallagher, an Episcopal layperson and writer, tells a story about her experience in a soup kitchen her church ran. (“Our Vulnerability, Born in a Manger,” http://arc.episcopalchurch.org/episcopal-life/Spir1299.html) Initially, the church handed out the soup through a little window in the church kitchen. But soon the summer turned to fall and the rainy season, and volunteers began asking why the homeless couldn’t come in. There weren’t really any good reasons not to invite them in, so they did. The men were quiet and orderly, eating and thanking the volunteers before they left. She continued her work there, making and distributing soup, eating with the other volunteers before they opened. Then one day, she looked up and saw a table with four homeless men, and a volunteer, who was eating with the men. The next week, she decided with fear and trembling to do the same. She awkwardly approached a table and sat down, and began an awkward conversation with the men sitting there. She was happy to have a conversation starter, and confidently asked these homeless men if that had seen the game the night before. There was a long silence, and then someone asked what game she was talking about. The world series game she replied, less confidently. Over the days and weeks, Nora continued to sit with these men, getting to know them. Alan was a Vietnam vet, and swept the floors every day after the meal was finished. Greg had mental illness, and helped wash dishes each day. One day, she arrived dirty after working at home, disheveled and in sweats, and without checking in, got in line with the others. When she got her soup, the woman serving her looked at her with pity in her eyes. She started to explain, then changed her mind, and sat down with her friends. The boundaries has ceased to matter for Nora Gallagher. When the scribe asked Jesus about the commandments, he wasn’t trying to trip Jesus up; he was genuinely curious. When Jesus answers, he responds in a curious way: by commending Jesus and reciting Torah and Midrash that support what Jesus says. He recognizes that laws and ritual and purity and prejudices and class and ability do not come before the actual person. This was unusual because the scribes had, in that day, lapsed into legalism – putting laws before people. But this scribe, he knew the difference between legalism and love. This is significant when Jesus observes the widow as she comes to the temple to make her offering. Notice that Jesus does not commend her; he just observes her and remarks on what she’s doing. In the eyes of the scribes, her act of giving all she has is laudable because she is keeping the law. But Jesus observes that she has not only given all she has, but all she has to live on. She now has no means for survival. For Jesus, this is a tragedy. She is not an example of what we should emulate. Rather, she is a case where meeting the letter of the law has taken precedence over the needs of and care for the widow. This is not in keeping with what the commandments say, for the scribes and treasurer have required death instead of mercy. In his conversation with the scribe Jesus commends him by saying, “Truly you are not far from the Kingdom of God.” But the other scribes he condemns. When we sit down at the table with the those who have different views and befriend them and eat with them, when we welcome a stranger into our midst, particularly one who is different, we are not far from the Kingdom of God. When love rules instead of law, when we speak against hate speech masquerading as politics, we are not far from the kingdom of God. When traditions – “we’ve always” or “we’ve never” - take a back seat to caring for another, we are not far from the Kingdom of God. There was a five-month old baby in the church who was sick, who because he was on iv antibiotics, couldn’t leave the hospital. 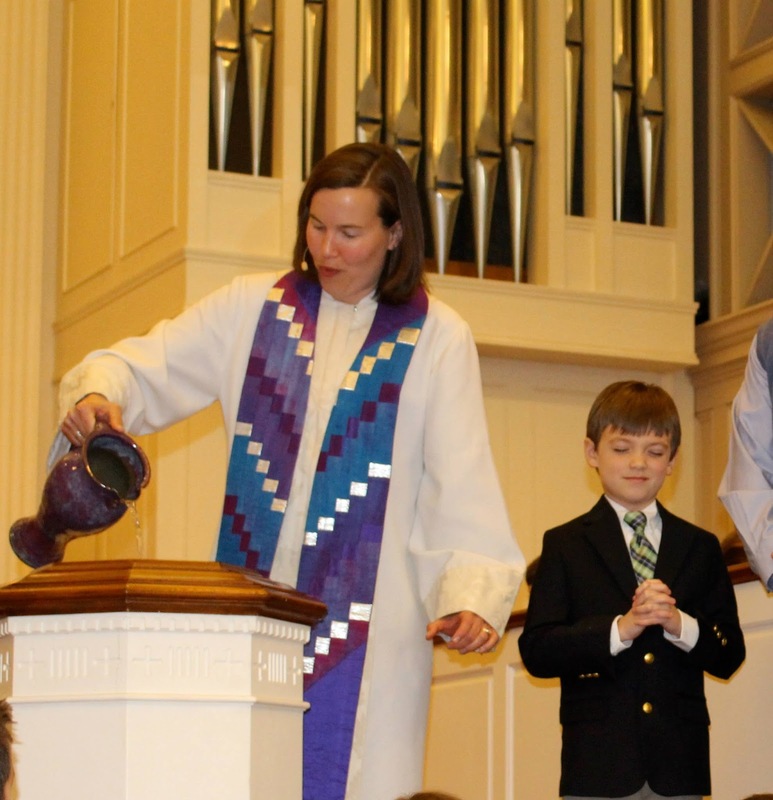 He was going to have heart surgery, and his parents wanted to baptize him beforehand. But he couldn’t leave the hospital. 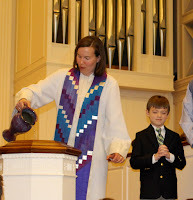 Now that church, like here, has the congregation make promises to the family and the child during the baptismal liturgy, but the congregation obviously couldn’t all gather in the hospital room, and most wanted to be there. So the pastor thought outside the box in the name of love. During worship this particular Sunday morning, the day before the planned heart surgery, our pastor put a picture of the baby up on the screen in front of the church. He asked everyone who could to take a picture of the picture with their cell phones. After the picture was taken, our pastor read the traditional baptismal liturgy just as he would if the family and their child had been there in person. When it came time for the congregation to respond we responded with our phones, texting the picture we had just taken to the child’s parents with 2 simple words attached. It was an incredibly holy moment where two worlds collided, the old and the new, to extend the hand of God to a family who needed His loving touch the most. Truly, they were not far from the Kingdom of God in that moment. When we come to this table, we come as Nora Gallagher learned to, to eat with those we might not have chosen to before. We acknowledge that being part of the body of Christ means forgetting the boundaries that divide. When we come to this font, we demonstrate, as Andy Stanley’s church did that love takes precedence over law, that our life together is shaped by love. We when partake in the sacraments, we are recall that, in love, God has gifted us with ways to know him and to love him, both in liturgy and in life. May we, in our, journey of faith learn to break down the walls that divide us one from another. May we, as we practice our faith, learn to value justice over law. May we, as we try to the best of our ability to keep the commandments, discover that we cannot do one without the other; that in loving God we cannot help but serve one another, and that in serving our neighbors, we cannot help but draw closer to God. 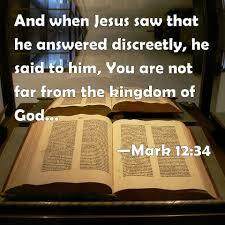 For then, truly, WE will not be far from the Kingdom of God, either.